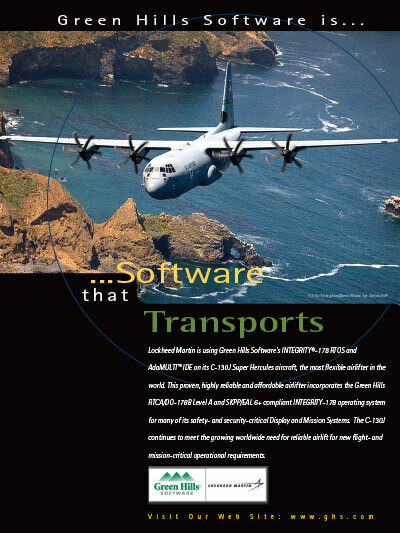 Lockheed Martin is using Green Hills Software’s INTEGRITY-178 RTOS and AdaMULTI™ IDE on its C-130J Super Hercules aircraft, the most flexible airlifter in the world. This proven, highly reliable and affordable airlifter incorporates the Green Hills RTCA/DO-178B Level A and SKPP/EAL 6+ compliant INTEGRITY-178 operating system for many of its safety- and security-critical Display and Mission Systems. The C-130J continues to meet the growing worldwide need for reliable airlift for new flight- and mission-critical operational requirements.